Frustration is growing in the State of Hockey and last night’s game against the New Jersey Devils certainly didn’t help. The Minnesota Wild dropped their fourth consecutive game, losing 3-1 in a lackluster effort. The lone goal of the night was scored by Minnesota native Ryan Carter. This game against the Devils ended the Wild’s three-game road trip, in which the team lost all three games against Ottawa, Montreal, and New Jersey. So far this season, Minnesota has only won two games on the road, a trend that cannot continue if the Wild want to stay in the mix at the top of the Central Division. All I know is if it takes Zach Parise to motivate the entire team, the Wild don’t have as much depth as I thought they did. 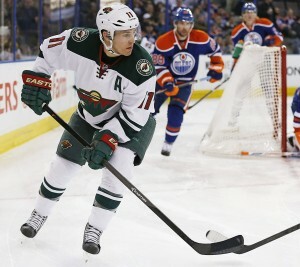 When you lose a core guy like Parise, that’s when the rest of the team needs to step up and play a little harder. Minnesota can’t depend on one guy to win games. Jared Spurgeon and Matt Cooke have also been missing from the lineup during this time, but the same line of thought applies here. Three players shouldn’t be able to dictate whether the team wins or loses. These loses haven’t just been loses, either. The Wild has scored a combined three goals in the past four games, while giving up a combined fourteen goals to its opponents. That’s not just losing; that’s being dominated in every game. I don’t mean to just sit here and rip the Wild apart. They’re clearly in a slump, but I don’t think it’s time for a full-blown panic yet. There’s still plenty of season left to play and I’m sure they’ll find a way to pull things back together, especially if they continue their winning ways at home and get Zach Parise and Jared Spurgeon back Thursday against the Sabres. P.S. Firing Mike Yeo isn’t the answer to this problem.